This paper introduces various forms of practical vibration and shock isolators that modify commercial-off-the-shelf (COTS) equipment so that it can withstand MIL vibration and shock environments. possibly damaging your hands and arms. gloves to “isolate” your hands from the handlebars. are smaller, less troubling, less likely to damage you. the mold was filled with liquid elastomer. relays, etc. were so delicate. equipment in aircraft and tanks, “floating” on soft isolators. and mass. I wanted to illustrate the words “isolate” and “isolation”. to drive a simple one spring, one mass load. factor or gain) = 1.
sprung mass (response) D >> input D.
We call this condition Resonance. we have further increased Ff. does for us, let’s examine the engineering involved. and extends to the right. At the end, Wayne had time to explain C / CC. higher than 1.414 times our natural frequency Fn. – have the same stiffness K.
See cross-sections of three bonded rubber-to-metal isolators. isolators. Neoprene, however, better withstands oil and grease. is perhaps a tolerable 10. Alternately, right, springs can be packed with stainless steel mesh. This provides damping (friction). on a single spring – that oversimplifies the “real world”. and many dampers. How will we isolate that? to discuss where and how to locate the several isolators. used in commercial and personal electronics. being clicked into a gun). material are inexpensively molded and quite easily inserted. In a sense, history is repeating. Figures 11 and 12 show preparation for an explosive barge test, as in Video Clip 4. The shocks received by that equipment resemble (to a degree) the shocks that would be received in actual service aboard a surface vessel or a submarine in the event of a “near miss” explosion, with energy traveling through the water and through the ship’s structure. The degree of that resemblance is often described by SRS – the Shock Response Spectrum. Are you involved with SRS? Perhaps you’d like to telephone me. Let’s talk about Isolator Selection Suppose that an assembly within the “cocooned” equipment resonates at 10 Hz, Fn=10 Hz. 10 Hz. Resonance. That’s bad. 100, 10, 5 and 2 Hz. Which should we use? 4 diagrams, much pointing, discussion. Isolators that are too stiff are useless. Isolators that are too soft bring on new problems. Let’s discuss isolating active equipment – machinery. Is a shaker used in your lab? Undesirable vibration is introduced into the buildings in which shakers are used. of 5 Hz. This should work fairly well. change. Now test down to 5 Hz. in picture. That would not be very stable. Let’s talk a little more about damping. 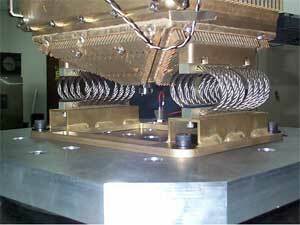 mass” M and a spring with stiffness K.
We also have a friction or damping element C.
present. No system exists without some damping. supporting the body mass. You have four springs. Let’s say a little more about “cable” isolators. or damping) accompanies flexing of the isolator assembly. Figure 18 shows a transportation application. motion into heat, and greatly slowing down the return journey. BG-PWB pads pulled away by sudden shock. This weakness not observable by any known test. Close-up of ductile rupture from previous slide. Estimate that only 10% was a real solder joint. saw a video clip of a demonstration on a shaker. the magnification “Q” value to say 10 if we must pass through resonance in coming up to speed. we are posting them on our Web site.